Homegrown Cotton Shirt in the News! My homegrown, handspun, handwoven, naturally-colored, cotton shirt is in the latest issue–April/May 2018–of the Mother Earth News! You can access the article online here, but it is prettier to read in the print magazine. I have come to the conclusion that the English language is deficient in vocabulary to adequately describe the value of our homegrown/homemade products. Each week my local farmers market devotes a booth space to a nonprofit organization for educational purposes. Recently that space went to Clothos Handspinners, of which I am a member. For my part, I set up a display to demonstrate how flax straw becomes linen thread, spun cotton on a spindle, wore my homegrown, handspun vest, and had my homegrown, handspun shirt on display. From conversations there, it was apparent that people wanted to put a value on my shirt and vest and the only way they knew how to do that was to put a price on them. Even though I made it clear that they weren’t for sale, I was repeatedly asked how much money I would take for my vest and shirt if they were for sale. This has happened to me before. These garments are priceless. I will not put a price tag on the cotton I grow and the labor of love involved in bringing these garments to life. Granted, when I grew for the markets I had to put a money value on my vegetables and eggs. I don’t do that now for the food I grow and for anything else I make for my family’s consumption and use and that which I give to friends. It is a relaxing way to be. Market growers need to grow high value crops to make ends meet. However, there are many other great things to grow and to make that wouldn’t bring enough money if you were to sell them, but would greatly enhance your well being. Unfortunately, putting a monetary value on things is how our society of consumers operates. There should be words to describe an item that includes more than the materials, labor, and overhead that are involved, which is what is usually considered when setting a price. How about the love that is extended in the growing and making? I truly believe that there is a special positive energy in something grown or produced with love and that the people who are the end users benefit from that energy. Likewise, if something is grown or produced by someone who is not of a loving nature throughout their work, the results would not be so positive. Cindy’s booth at the 17th St. Farmers Market, Richmond, VA in 2001. Photo display is in the back. With that in mind, you might want to keep a positive attitude with everything you do. If you are not growing all of your food, take care to get to know the producers of the food you buy. At first glance, the vegetables might look the same, but rather than make your decision on price, dig deeper and make your purchase decisions on attitude. Ask questions, such as; what kind of fertilizers are used, how are the plants protected from insects, and if measures are taken on their farm to build the ecosystem. Those growers who are in tune with their land will be oozing with great information. From their answers, you will identify those you might want to steer clear of. I once asked a grower what he did to keep Colorado potato beetles from his potatoes. He proudly told me about a product from Bayer that knocked them dead. Needless to say, I did not buy potatoes from him. On the other hand, a grower might tell you that she has no problem with potato beetles because she has a diverse ecosystem on her farm that attracts beneficial insects that take care of the bad ones, which is what has happened at my place. The Inuit language has more than fifty words that describe snow. I wish we had the vocabulary to describe the value when someone puts their heart and soul into what they produce. Here in the United States we have different labels, such as Certified Naturally Grown and USDA Organic, which help to differentiate the growers, but there is more that goes into things than is measured by those terms. How do you adequately quantify and express the love and care involved? I sold vegetables and eggs from 1992 through the 2001 season. Although I followed good organic practices, I never bothered to get certified organic because I was selling directly to restaurants and families and I told them how I grew things. When we started the Ashland Farmers Market in 1999 I had a photo display that showed my gardens and compost piles. Besides being an educational tool, it gave people a reason to stop, see what I was doing, and ask questions. In 2001 I also sold at the 17th St. Farmers Market in Richmond, VA. Two of the farms at that market were certified organic. A few weeks after the Richmond market opened for the season the monthly publication, Fifty Plus, came out that included an interview with me. I had turned fifty that year and I was on the cover holding a chicken! In the interview I explained how I did things at my farm, working with nature and making compost. The next week a woman came to my booth to shop and said that in the previous weeks she had only bought from the certified organic growers because she thought they were the only ones who had what she valued. After reading about me in Fifty Plus she realized that I was the one she wanted to buy from. It is with more than food that we need to look deeper. Everything has energy and we should want to make sure that it is as positive as it can be for the things we bring into our homes and lives. With my work with fiber, I know that not everyone is going to go out and grow their own clothes. My hope is that it will open the thought process of discovering the origins of the clothes that are being worn now. What is the fiber used and what are the environmental consequences involved in bringing it to you? Who made the garments and how are they compensated for their work? The list of questions could go on and on for each thing that comes into your life. I don’t mean to burden you, but to urge you to look at everything with new eyes and to recognize the all encompassing energy that is involved. How do we express the value of things that are produced with the heart? I believe we can feel it, but have no words at this time to express it. I took a serious interest in growing cotton and learning to spin it in 2011. I had grown a few cotton plants at a time before, but that year I planted an 80 square foot bed of Nankeen Brown and 22 square feet of Erlene’s Green. The cotton beds were about 100 feet apart. My first weaving project, a nametag, used cotton from the 2011 harvest and in the photo you can see the brown and green I grew. The white was from cotton I grew in the late 1990s. I cropped this image of the nametag from a photo taken by Mary Delicate, while I was wearing it at a VABF conference. A nametag might seem like an unlikely first weaving project, but I made it to wear at my spinning group meetings and have had fun with it elsewhere. It has come in handy to document those early colors. Although my records show the brown variety was Nankeen, that has been called into question recently since, apparently, Nankeen Brown has fuzzy seeds and my brown has naked seeds. Learn more about that at Seed Conundrum. My cotton varieties were much closer than the recommended distance for avoiding cross pollination. The crossing was not reflected in the fiber that year from the parent plants, but held within the seeds. Some plants would have been pollinated by those of the same variety, but others would have been touched by pollen from the other variety. The plants that grew from those cross-pollinated seeds would be the F1 generation. You have probably seen varieties designated as F1 in seed catalogs. That is always an indication that it is a hybrid. With hybrids, the parents are from different varieties of the same crop, and their offspring (F1 generation), although a mixture of genes with loads of potential, produce a predictable crop. Hybridization is done to produce the special qualities that can be found, and predicted, in that F1 generation. It is when you move beyond the F1 that things get exciting. In 2012 I grew cotton from the 2011 harvest. The seeds for the green cotton were fuzzy and the seeds for the brown were naked. The green and brown colors of cotton that I grow are faint at harvest, deepening to their ultimate color once the skeins are scoured by boiling in soapy water after spinning. Since I was not aware of the extent of the crossing, I didn’t examine the fiber from each bed, considering everything from the green bed green and everything from the brown bed brown. I would have had to look closely to distinguish the difference in color within each bed when the fiber was all mixed together. In the photos, the color looks evident because it has already been sorted. Part of the 2014 Green bed harvest. I was spinning the cotton off the seed, so I didn’t see the seed until the fiber was already on my spindle. Examining the seeds helps determine differences. Once I scoured the spun yarn and the colors popped, I could see how much crossing had occurred. The vest I made in 2014 contained harvests from my 2012 and 2013 green cotton beds. It made for a wonderful pattern and made me think about what was happening with the seeds. Part of the 2014 Brown bed harvest. In 2014 I planted brown and green cotton seeds saved from the 2011 and 2012 harvests. In 2015 and 2016 I grew Red Foliated White cotton only. I decided to study my 2014 harvest by closely examining the seeds and fiber from the green and brown beds. The fiber from the green bed was either green or light brown and the seeds were all fuzzy. The fiber from the brown bed was brown or light brown, with the darker brown having naked seeds and the lighter brown having fuzzy seeds. It appeared that what had crossed expressed itself as light brown, whether in the green bed or the brown bed. Apparently, brown is the dominant color. The green cotton had a more silky feel than the brown and that showed up some in the light brown fiber. The feel of the fiber helped me separate the brown bed harvest. Next, I wanted to see what would happen if I grew out these four sets of seeds. I enlisted the help of my daughter, Betsy, daughter-in-law, Stephanie, and friends Molly, Susan, and Margaret. Betsy had seeds from the brown bed with the dark brown fiber (B/B), Stephanie grew out seeds from the brown bed with the light brown fiber (B/b), Molly and Margaret grew out seeds from the green bed that produced green fiber (G/G) and Susan grew seeds from the green bed that produced light brown fiber (G/b). I asked them to grow out about 10-12 plants for me. Some grew more than that, and some grew less. None of them are spinners or have any other interest in cotton other than joining in the adventure with me. I have wonderful family and friends! Most likely this was the F2 generation, but some could be F3. What Betsy grew, B/B, was uniformly dark brown fiber with naked seeds. Stephanie had light brown and dark brown fiber, all with fuzzy seeds. Surprisingly, she also had four bolls with white fiber! Although they just look dark and fuzzy now, the lint on the seeds of these white bolls definitely looked green at harvest. Harvest from Molly and Margaret (G/G). we were expecting mostly green fiber. I thought that the plants with fiber that was definitely dark brown or green had not crossed. That was apparently so with Betsy’s harvest, but not so with Molly’s and Margaret’s (G/G). They had fewer plants, but nevertheless, I was expecting green and instead, got light brown to tan, with only a very small amount of green. Green is definitely recessive and elusive. Susan’s harvest (G/b) was sorted into 9 colors/shades. Susan (G/b) had a very interesting harvest with the most variation of green and brown and some of her colors were quite dark when scoured. Although most of her harvest had fuzzy seeds, she had some medium brown with naked seeds. I am sorting the colors of each harvest and spinning them separately, then scouring to find the true colors. In my garden this year I am growing the greens. I have pulled two from Susan’s harvest, the small bit from Molly and Margaret, and I will be including Erlene’s Green from Southern Exposure Seed Exchange. I’m looking forward to seeing what I will get, knowing full well they will be crossing with each other. My wonderful crew is helping me again this year. Stephanie is growing out the white cotton. With green fuzzy seeds, we’re thinking she will get more than just white fiber. Molly and Margaret are each growing the light brown/tan fiber from their harvests. There should be green in there somewhere. Susan is growing seeds from the plants she grew that yielded silky brown fiber and had green fuzzy seeds. Betsy had to bow out of The Cotton Project this year because she is growing cotton for Southern Exposure. They asked her to grow Nankeen Brown, which is how we realized there was a question with naked vs. fuzzy seeds for that variety. Sally Fox of Viriditas Farm has been researching colored cotton since the 1980’s and has been breeding for longer staple length and color. She says she has some F19 generations of cotton that haven’t settled yet and still yield surprises. We are having a good time with this and, from looking at Sally’s experience, it appears the adventure could continue for quite some time. Nankeen Brown and Erlene’s Green cotton with a tahkli spindle. The fiber is lighter at harvest, as you see in the bolls, and darkens once you scour it. I love to spin cotton, but I will be the first to admit that it is not an easy thing to learn. I had no knowledge of spinning any fiber when I took on cotton, but I wanted to learn to spin fiber that I grew in my garden. Wool spinners had told me it was hard to spin cotton because it was such a short fiber. However, since I would learn on cotton, I figured that would be my normal. Cotton is a short fiber, being only about an inch or so long, more or less. You are probably familiar with seeing drop spindles that spinners use. You see them hanging from the fiber in front of the spinner while she/he works. Short fibers, such as cotton, require a lighter weight supported spindle. The tip of the spindle rests in a small dish while spinning. I needed to acquire a spindle and instruction, so I turned to Joan Ruane in Arizona. I didn’t make the trip there, but learned from her video, which came in a kit that included a tahkli spindle, support dish, bobbins, and cotton sliver. It took much practice to go beyond something that resembled rope to something that resembled thread, but I kept at it. Eventually muscle memory kicked in and things got easier. Joining a handspinning group helped tremendously. When you look for cotton fiber to spin, most likely what you will find is cotton sliver, which is a long rope-like preparation. You might come across roving, which is a thinner preparation of sliver. I often use the words sliver and roving interchangably. I learned when working with sliver that, by dividing it lengthwise into several strands, it was easier to work with if I only used a strand at a time. You might also find cotton in the form of punis, which is cotton that has been carded and rolled into cigar shapes. I have never spun from punis. Box holding tahkli for winding off; plastic, wood, and homemade bamboo bobbins; lazy kate that holds two bobbins for plying. None of those preparations are quite like what you will be working with from your homegrown cotton, but it is something to learn from. I believe that anyone learning to spin should learn to spin with a spindle before progressing to a wheel. For one thing, it is cheaper to get started. Also, you gain skills that will help you with any spinning. With only one tahkli spindle I was able to spin enough cotton to make my vest, which you can learn more about here. Once the spindle was full, I would wind it off onto a bobbin and fill the spindle again. In the photo you can see the cardboard box I used to hold the spindle while I wound off onto bobbins. I bought plastic and wooden bobbins and even made some from bamboo. With 2 bobbins on a lazy kate, I could ply the cotton on a larger spindle made with a dowel and 2” wooden wheel. 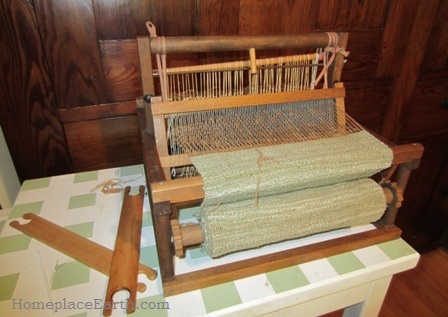 I used 2-ply cotton for both warp and weft when I wove the fabric. Indian book charkha from New World Textiles. After the vest, I made a shirt. By this time I had acquired an Indian book charkha from New World Textiles and used that to spin all the cotton for the shirt. I had also acquired a Louet S10 spinning wheel. I used the spinning wheel for the plying, but I needed to get a high-speed bobbin to do it. No matter how fast I treadled, the regular bobbin did not go around fast enough. Cotton requires a high spinning ratio. Plying with the wooden spindle worked great, but using the spinning wheel for that job was faster. I can spin off the seed with the tahkli, but find the charkha is so fast that it is better to take the seeds out first, which I do by hand. However, when I first started working with cotton I thought I would need to card it. Cotton cards cost more than I wanted to spend for a project I was just getting into, so I bought dog brushes at the pet store. They worked fine. I’ve since acquired regular cotton cards, but the lighter weight dog brushes are great for starting out. I only card the fiber if it has become compacted. I’m working with some cotton right now that I didn’t grow. This cotton had the seeds removed with an electric cotton gin and I find that I need to card the fiber before spinning. Some spinners card cotton and roll it into punis. I find that unnecessary. The fiber that I’ve taken the seeds from is loose enough to spin as it is and the fiber that I’ve carded is also loose enough. Of course, spinning it off the seed is the easiest way and that can happen with your homegrown supply. Sliver, roving, and punis are fiber preparations that are better for commercial transactions. They can be manufactured, measured, stored, and shipped easier than working with cotton fluff pulled from the seed. Actually, in manufacturing, the fiber isn’t pulled from seeds, it is cut from them in the ginning process. Swift with skeins and balls of naturally colored cotton for a shirt. When I made the vest, I worked with one spindle at a time and put the fiber on bobbins. From there it went into skeins. Since three spindles came with the charkha, once I had three spindles full, I wound the fiber from all three spindles into one skein using my swift. Lacking a swift, you could wind it around anything that you could remove it easily from. I scoured the skeins by boiling them in a large pot of water with washing soda and a bit of soap. That is when the color pops. The fiber was then wound into balls over a core of crumpled paper. The balls you see of cotton in this photo are what I prepared for my shirt. The cotton you grow in your garden is a premium product. Hand picking ensures that the fiber is never subjected to the harsh treatments that commercial cotton is. Take care in the picking to not also gather leaves or other bits of the plant that will dry and be hard to pick out later. Removing the seeds by hand is not hard. You can take a small bag of seeded cotton with you anywhere and work on the seeds while you are waiting for whatever you need to wait for. It is good to keep your hands busy. Save the seeds to plant next year. For spinning, I have recently moved up to a Bosworth attache charkha, which is wonderful. As much as I like it, I would hope that you start your cotton journey with a tahkli, like I did. I still use my tahlki and spin with it in public whenever I can. Spinning in public is a great way to meet people and spread the word that this is actually something you can do, not something out of the history books. Have fun spinning! After being away from this blog since I broke my wrist in March, I’m back! To celebrate my return, I am offering a 25% discount through January 1, 2017 on my cover crop and garden plan DVDs and on my books Grow a Sustainable Diet and Seed Libraries. As always, shipping is free in the US. My DVDs and Grow a Sustainable Diet are educational tools and used in the sustainable agriculture program at Reynolds Community College in Goochland, VA where I used to teach. When I produced them, I had in mind those who couldn’t take my classes in person. So, if you have been wanting to learn more about cover crops, garden planning, planni ng your diet around your garden, and planning your permaculture homestead, take advantage of this opportunity to purchase an educational program that will walk you through the process and help you apply your new found information to your own situation. Or, you may have someone on your holiday gift list that would benefit from these materials. You’ll find these sale prices on my website at www.HomeplaceEarth.com, along with deals for a few great books that I didn’t write. waiting for me to build some fiber tools to process it (next on my to-do list). I trialed two kinds of rice this year. I also grew Japanese indigo and used it for some dye work, part of my new focus on fiber and textiles. Once I was sufficiently recovered, I was back to spinning my homegrown naturally-colored cotton for a shirt that I intended to make, weaving the fabric on my small table loom. It’s finished and I wore it for the first time on Thanksgiving. a shirt. Hurray! I’ve used my time away from this blog to read and learn more about the history of textiles. What was once local production fueled the industrial revolution and the exploiting of people and resources has continued ever since to bring us cheap clothes—way too many cheap clothes. When you shop for clothes I would like you to consider how the people who produced them and the earth that provided the raw materials were compensated to bring you such bargains. There is much to talk about on this subject, so stay tuned. I will be telling you all about my new homegrown, handspun, handwoven, naturally-colored cotton shirt in a future post. I will also be sharing my adventures with the flax, rice, Japanese indigo and other natural dyeing, while I continue addressing the many topics you have enjoyed in this blog. Learning about my new shirt, however, will have to wait until I fill you in about what has been happening in the seed library world. Seed libraries have been deemed exempt from state seed laws, by the way. You can learn more about that in my next post, which should appear next week. After that I will go back to my old schedule of posting every two weeks. The video Seed: The Untold Story has been making the rounds and will be shown in Charlottesville, VA on December 8. You need to reserve your ticket ahead of time and you can do that here. After the film there will be a question and answer period with a panel staffed by folks from Southern Exposure Seed Exchange and ME. If you go, be sure and catch me afterwards. I’m always happy to meet the people who read my words. I entered my homegrown handspun cotton vest in the Fall Fiber Festival that was to be held at Montpelier Station, VA on October 3-4, but because of impending weather conditions, it was cancelled. 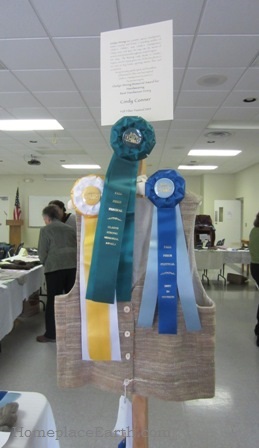 However, the judging for the Skein and Garment Competition had already taken place the week before. In order to show off the wonderful entries, Clothos, the handspinning group sponsoring the competition, decided to display them at their already scheduled meeting on October 10. It was an opportunity for everyone to come and see the exhibit and for the exhibitors to pick up their entries. As you can see from the photo, my vest was a big winner! My vest won its class of Handspun Handmade-wearable, Best in Division, and Best in Show. It also won the Gladys Strong Memorial Award for Handweaving. I was thrilled! There were so many wonderful entries. As you know from previous posts, this vest has been a long time coming. I began learning to spin in 2011 and joined Clothos in November that year. I was definitely a newbie at this. It seemed to be slow going for quite awhile, especially since I became sidetracked writing two books. But I kept at it. This vest was a personal challenge. I wanted to see what I could do with my own homegrown cotton. The festival was not even on my mind when I completed it in June. It was at the urging of Clothos members that I entered it in the competition. On Saturday several of them expressed their pleasure at how well my vest had done—to the extent that they felt that they had won also, and rightly so. They remembered me coming that first time with my spindle and cotton in hand. Month after month, they would be working on all sorts of projects and there I was, still with my spindle and homegrown cotton. I had so much to learn and the Clothos members were very giving with their knowledge and skills. Each month I gained just by watching and listening. The chairs are set up in a circle in the large room at the fire station where we meet and I make a point of going around the circle to find out what each one is doing. Many use spinning wheels, which I’m learning about now. There is always someone ready to answer any questions I have. If you have wanted to learn something, be it spinning and weaving, playing a musical instrument, fixing your car, gardening, or some other skill, it is not too late. Find people who know about that and jump right in. Take classes or join a group. You will meet new people and make new friends along the way. It is nice to know that my interest in homegrown cotton is valued by others and is not just a quirk that I have. I will never top my winnings of this year in the competition. Nevertheless, I am excited to try new things and keep pushing the limits of what I can do. Maybe one year there will be a division or a class in the competition requiring the fiber used, whether animal or plant, to be grown by the artist. That would be fun. It you want to see my vest, I’ll be wearing it at the Mother Earth News Fair in Topeka, Kansas on October 24-25. Come and see me there! Cindy in her homegrown, handspun cotton vest. My new vest is finished! 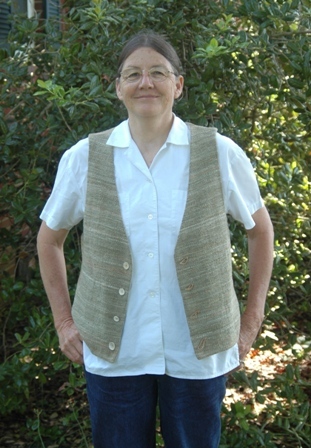 In the photo I am wearing my new homegrown, handspun, handwoven, naturally-colored cotton vest. It has been a long time in coming. Growing the cotton and sewing the vest are skills and knowledge I already had. The spinning and weaving were things I needed to learn. Homegrown cotton and takli spindle. In February 2013 I wrote of my cotton spinning journey in my blog post Grow and Spin Cotton. I’ll repeat the photo here of my Nankeen Brown cotton, Erlene’s Green cotton, and takli spindle. All the fiber for the vest was spun on that spindle. Since cotton has such a short fiber length, it is helpful to use a support spindle, which is what a takli is. A small bowl supports the bottom of the spindle while it spins. Once the cotton was spun into singles I plied two singles into 2-ply yarn, which is what I used to weave with. The plying was done on a drop spindle that I made from a dowel and a small wooden wheel. Small table loom with fabric for homegrown, handspun cotton vest. Joining Clothos Handspinners has been an important part of this fiber adventure. I learn so much from attending the meetings and interacting with the members. Every two years the group holds a swap meet which is an opportunity for members to sell extra equipment, fiber, and books and for others (like me) to acquire it. Some of that trading also goes on informally at the regular meetings. The swap meet was where I bought my loom. Then I had to learn to use it. This vest has not been an easy project. The loom is 12” wide, but my resulting fabric was only 9½” wide. I made a pattern from the quilted vest I wear, and from that, designed a pattern that used 9½” wide fabric. Since 9½” is not wide enough for a full front or back panel, there are side panels that make up the difference. 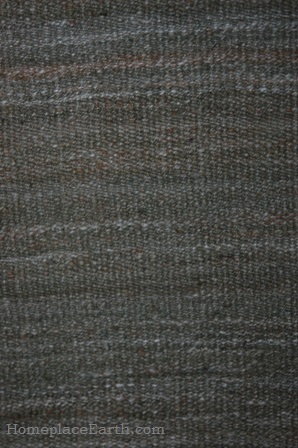 Erlene’s green and Nankeen brown cotton spun and woven. I used brown for the warp and green for the weft. As you can see, the weft is dominant in the weaving. I grew both colors in the garden and, although they were a good distance apart, there was some crossing. I didn’t notice green in with the brown, but there would be some brown in with the green. Maybe brown is the dominant color when it comes to genetics. When I was spinning I didn’t separate the off-color fibers, so there was some brown spun with the green, just as it was harvested. 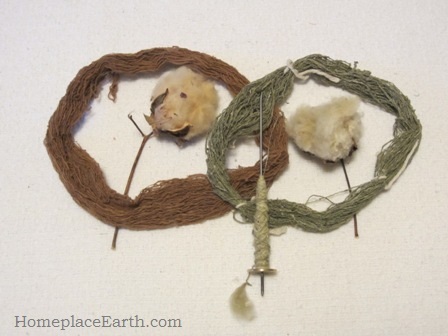 The fiber from the green cotton plants also had bits of white. It made for a pleasant variation in color in the finished fabric. Although I did do some carding, mostly I spun the fiber right off the seed. As noted in my 2013 blog post, my 2012 yield (fiber only, no seeds) was .75 lb (green) to 1 lb. (brown) fiber per 100 sq. ft. The weight of my vest is 11.5 oz. (.72 lb.) including lining and buttons. Frequently people assume I would have had to grow cotton on a larger scale to produce an item of clothing, but this can be done in a garden. I used cotton osnaburg fabric for the lining—a piece I had left from a previous project. Osnaburg has an earthy appearance and seemed right for the vest. Besides, I already had it. Button made from a shell on the homegrown, handspun cotton vest. Although I usually don’t button my vests closed, I wanted to have buttons and I wanted them to be special. My first thought was to make wooden buttons, but then I remembered the jar of shells our children picked up at the beach many years ago. I used small vice grips to nip the edges of a shell off—going round and round until it was the size I wanted for a button. Then I drilled two ⅟₁₆” holes in each button. I didn’t want to put buttonholes in my new fabric so I made loops by braiding my brown cotton yarn to close the vest, if I should want to. This was my first time making buttons from shells and I am pleased with the results. In the photo you can see a bit of the osnaburg lining. Now that I know how to spin and weave, the possibilities for unique yarns and fabrics are endless. I will be learning about natural dyes and eventually learn to spin wool and to use a wheel. When I was at the Mother Earth News Fair in Asheville, NC in April I bought a book charka from Eileen Hallman at New World Textiles, but I haven’t used it yet so as not to distract me from finishing the vest. Once I learn how to use it, the charka will speed up my cotton spinning. For this vest I wanted to use the least technology that I could, not only because it was the least expensive way to go (which was a consideration), but because I wanted to relate to how people down through the ages worked with fiber to clothe themselves. I’m sure in some places people still depend on these methods and, you can be sure, I kept them in my heart while I worked. When I first grew cotton I had no idea what to do with it and put it away in a box for at least ten years. It has taken some effort to learn to spin and to get to the point of making a vest with my homegrown cotton. I might have finished the vest earlier if I wasn’t sidetracked writing two books during that time. You might not be into growing and spinning your own cotton, but there is probably some other adventure that has been rolling around in your head for awhile—maybe even ten years or more. I want to encourage you to go for it. If I can learn to do this, you can learn new tricks, too. I’ll be wearing my new vest at upcoming events this year, which are listed here. First up is the Slow Living Summit in Brattleboro, Vermont on June 3-5. See you there!